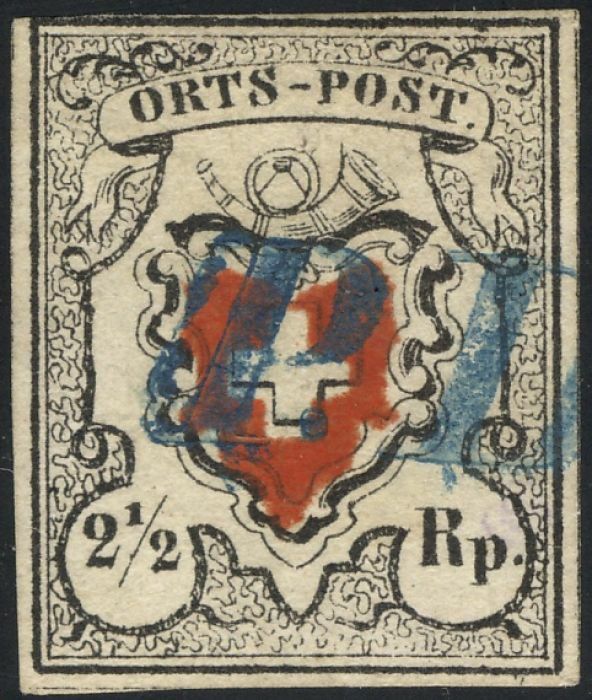 Though the stamps inscribed Orts-Post were intended for use in the German speaking parts, and the ones inscribed Poste Locale were to be used in the French speaking parts. However, both types were distributed in both areas. You can therefore find German inscriptions used in French speaking areas, and vice versa. These stamps are found in 40 types, since the images were produced one by one onto the printing stone, in 5 rows of 8 stamps. The stone was used twice to create sheets of 80 stamps. Later four imprints of the original stone was used to produce sheets of 160 stamps. Wheather the cross in the center of the stamp has a frame or not was decided by the way the lithographic stones were produced. At first, the frame was missing due to the printer not adding ink for it to print. Later he inked the frame, perhaps because he thought it improved the look. Eventually the postal administration asked that the cross not be framed, and it was removed from the printing stones. Prepayment of mail became mandatory as of the issue of Rayon I and Rayon II stamps, on October 1, 1850. Rayon I: for letters up to 10 miles. Rayon II: for letters from 10 to 25 miles. Rayon III: for letters from 25 to 40 miles. Rayon IV: for letter over 40 miles. The light blue Rayon I stamps were issued from March 1, 1851. Stamps inscribed Rayon III (Scott #11 & 13) were issued from January 1, 1852. Scott #12, with larger value inscription, was issued from April 1852.